This French restaurant in Bangkok occupies an elegant, colonial-style villa and has a relaxing ambiance, though it’s right in the heart of the city. With generous space for parking, Brasserie 9 is easily accessible in three ways, from Sathorn Soi 6, Silom Soi 3 (Soi Piphat) or Narathiwat Soi 3. 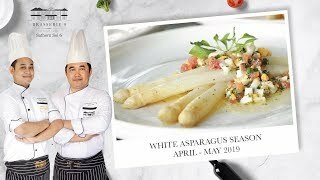 Make the most of the White Asparagus Season at Brasserie 9, where no fewer than four choices are on offer: Grilled White Asparagus, White Asparagus with Parma Ham, White Asparagus with Warm Egg Caviar and White Asparagus with Hollandaise Sauce. Take your pick or – better still – be sure to try all four.